People often ask: where are there some real world examples of blockchain being used that have a truly legal dimension? Well, here is one. 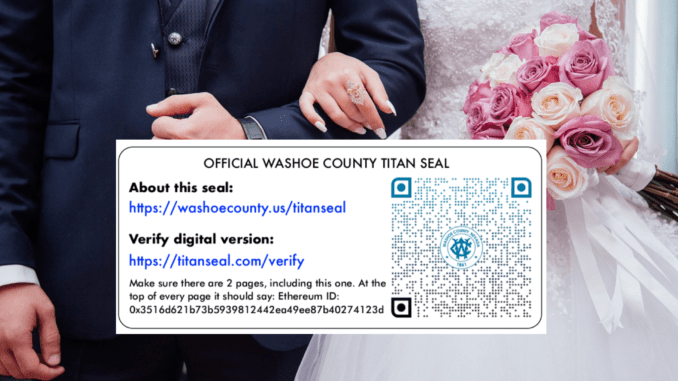 In the US, at least one region, in this case Washoe County, Reno, in the State of Nevada, has started making use of the Ethereum blockchain, via a company called TitanSeal, to provide newlyweds with an immutable digital record of their holy matrimony. 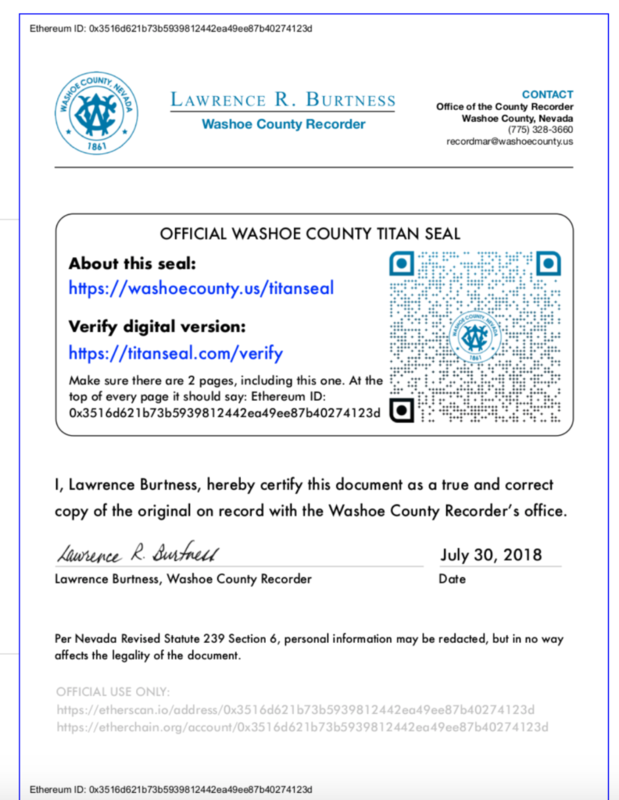 Below is how Washoe County describes their new blockchain digital marriage certificate pilot and how you can get one, if you felt like taking a trip to Reno to get married. ‘Traditionally, our office has mailed paper certified copies of marriage certificates with an embossed seal and wet signature. We are now offering a service that allows certified copies of marriage certificates to be emailed and received within minutes, and it requires no special technology besides the ability to view a plain PDF. We have partnered with Titan Seal, a Northern Nevada blockchain startup, to bring their patent-pending technology to anyone who needs a certified copy of a marriage. During the pilot phase of this project we are offering digital certified copies of marriage certificates to customers who inquire about expedited shipping and are comfortable handling an electronic document. An example of the Titan Seal for a marriage certificate in Washoe County. Note the Ethereum ID. We will email you your marriage certificate as a PDF file, then you email or otherwise electronically transfer it to whoever needs it. Verification instructions for the receiving agency are included inside the file. Before we email your certificate, Titan Seal puts a secure, cryptographic hash of it on the Ethereum blockchain. The hash is a unique number that can only be generated from your certified copy of your marriage certificate, and the Ethereum blockchain is a financial ledger that is protected from modification by a worldwide network of powerful computers. Titan Seal combines these technologies by putting the hash of your marriage certificate into the “memo field” of a blockchain transaction. To prove that your marriage certificate is unmodified, and therefore still certified, the hash of it is generated and compared to the one on the blockchain. How long does a digital certified copy last? The Ethereum blockchain will be around as long as the Internet itself is still around. Titan Sealed certificates do not contain any proprietary technology and are simply plain PDFs. As long as you store your certificate electronically, without altering it, it will always be valid. Is a digital certified copy secure? It is very improbable that the Ethereum blockchain could ever be ‘hacked’. There is no central authority or computer to compromise; instead there is a worldwide network of thousands of computers that work together to protect the authenticity of transactions on the network. This is one of the most secure methods of storing information that has ever been invented, and it has already spawned a renaissance in parts of the computer and financial industries. It is much more secure than our current method of paper certification (embossing, stamp, and signature), which is the gold standard of paper certification, but can still theoretically be forged. So, there you go. Don’t let anyone ever tell you that no-one is using blockchain for anything legally binding or in the real world. You can’t get much more real and legally binding than a marriage…!